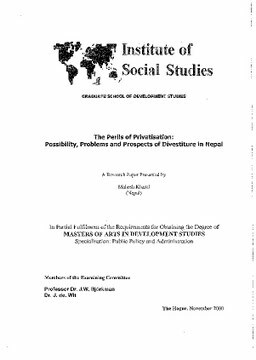 The main objective of research is to evaluate the impact of divestiture policy in Nepal as a case of privatisation. To support this focal objective, the specific functional objectives are: to assess the performance of privatised enterprises, to evaluate the efficiency of privatised enterprise, to identify the challenges of the privatisation process such as employment, transparency. The main research question is " Whether the divestiture policy succeeded in achieving its micro and macro level objectives". The hypotheses to clarify the main question are as follows: Divestiture policy assists to reduce financial burdens of the government, Divestiture policy contributes to enhancing the efficiency of enterprises, Divestiture policy facilitates popular participation in management.